I have one word for you – Colgate. I’m sure you’ve heard all about the #brushswap publicity stunt by now, with most papers having covered it already. However, let me give you the brief run down in case you haven’t. Colgate set up a promotional stand in London’s Waterloo Station on Monday, encouraging people to bring an old electric toothbrush in to exchange it for a brand new ProClinical A1500 worth 170 smackaroos. No catch, just turn up and trade your electric, plaque-encrusted peg cleaner in for a shiny new one. Except, there was an unforeseen catch, because it took just 24 hours for the giveaway event, which was supposed to run for five days until this Friday, to come to an end. Why? Well it turns out that everyone who’s anyone wanted one of these toothbrushes. Thousands of people turned up to claim their freebie (courtesy of media coverage and MoneySavingExpert newsletter mentions beforehand), causing extra havoc in what is already Europe’s busiest railway station. By 7am on Tuesday morning, Colgate had already handed out the 150 products it had available, with some people waiting around from 5am to claim their new toothbrush (keen, right?). So, Colgate seriously underestimated the popularity of the giveaway. Or did it? I know you’re probably thinking by now that this write up belongs beneath the “bad PR” title, but I’d say that you were wrong. It’s easy to think that, with headlines such as “Brush hour at Waterloo: crowds bristle” (Evening Standard) and “Colgate gives commuters the brush off after publicity stunt backfires” (Metro) but that’s exactly it; as least the headlines exist and the story got widespread national coverage. Such a promotional stunt would never normally be given the time of day by newsdesks UK-wide, but the mayhem caused by that one little stand in Waterloo got it the media attention Colgate was looking for. @ColgateUK tweeted “We’re sorry to say that #BrushSwap won’t return to Waterloo this week. We're looking at alternatives and appreciate your patience” Do you think this chaos will put people off trying to get a new electric toothbrush when a new location is announced? Of course it won’t. Manky teeth or not, people will still show and this PR stunt will be remembered for some time. 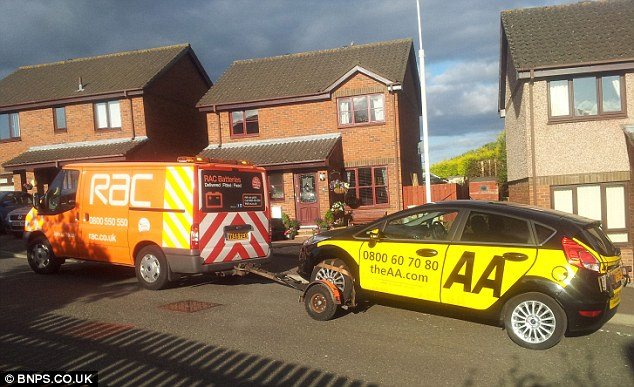 The AA was left a little red-faced in the press this week, after a vehicle from its driving school broke down. Now, it’s not the fact that the vehicle needed rescuing that was bad. When the instructor looked for help, it was arch rival the RAC that come to the rescue. The car had a flat tyre in Bonnyrigg, near Edinburgh, during a driving lesson and the instructor was allegedly turned down help from the AA’s own breakdown service. The company that leased the Ford Focus to the AA was covered by the RAC. A spokesperson from the RAC, not wanting to turn down the opportunity to poke run at its rival, said, “I’m sure the decision not to help out its own driving school is one the AA is regretting now.” The AA obviously hadn’t done its homework to check that all instructors and vehicles were “living the brand” and the vehicle was towed to a local garage by the RAC for a tyre change, following the big orange van like a yellow lovesick puppy. The AA car in which the driving lesson was taking place apparently had no spare wheel, which was another blow to the brand. I’m sure the AA is making some changes within the company as I type, to ensure that the RAC never has to come to the rescue of one of its vehicles again.